Mountain Parakeets (Psilopsiagon aurifrons), also known as Golden-fronted Parakeets, are an endangered species found in the coastal regions, adjacent western slopes of the Andes in central Peru, as well as parts of Argentina, Bolivia and Chile. The Mountain Parakeets average 6.8 to 7 inches (17 to 18 cm) in length - including the tail. The forehead, lores (the regions between the eyes and bill on the side of a bird's head), foreparts of cheeks are green. The throat and upper breast are lemon-yellow. The sides of the breast are yellow. They have yellowish-green thighs, and the under wing-coverts are bluish-green. The primary coverts are greenish-blue and the outerwebs of the primaries (longest wing feathers) are violet-blue. The underside of the tail is bluish-grey. The bill is horn-colored and the irises are brown. The cere and feet are pink-flesh color. Females lack the yellow on the forehead and lores (the regions between the eyes and bill on the side of a bird's head). Immature birds look like females, but have a shorter tail. Species Identification: Many aviculturists and some museums frequently confuse the Andean Parakeet (Bolborhynchus orbygnesius) with the female of Margarit's Parakeets (Bolborhynchus aurifrons margaritae) or Red-billed Parakeets (Bolborhynchus aurifrons rubrirostris), which also have dark colored bill. Both species can be easily identified from tail length. 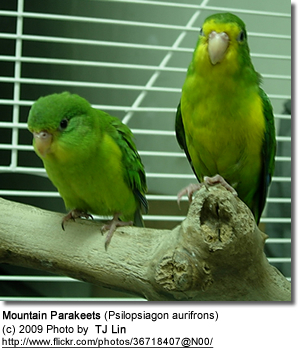 In Mountain Parakeets [Bolborhynchus aurifrons] the tail is usually over 2.75 inches (70 mm). The shape is different as well. The Mountain Parakeets have long and pointed tails, while the Andean Parakeet's tail is short and broad. Screaming: Mountain Parakeets are considered "moderately noisy." Even though their natural call / voice cannot be entirely eliminated; but their occurrence can be reduced. Description: The Margarit's Parakeet averages 8 inches (20 cm) in length (including tail). They look similar to the Mountain Parakeets aka Golden-fronted Parakeets described and featured above, but without any yellow. The green plumage is generally darker. The bill horn-colored and the irises brown. The cere is pink-flesh colored and their feet are grey. Females look similar, but the plumage is generally a darker green. The upper beak is grey with a pale tip. The lower beak is horn-colored. Immatures look similar to males, but have shorter tails. Description: As Mountain Parakeets aka Golden-fronted Parakeets described and featured above, but without any yellow. The green plumage is generally darker and with a pronounced bluish-grey tinge. The bill is pink-horn colored and the irises are dark brown. The cere is flesh-colored and the feet are grey. They average 8 inches (20 cm) in length, including the tail. Females look like males, but their plumage is generally a darker shade of green. The upper beak is grey with a pale tip. The lower beak is horn-colored. Immature birds look like males, but have a shorter tail. Description: As Mountain Parakeets aka Golden-fronted Parakeets, but yellow restricted to forehead, lores (the regions between the eyes and bill on the side of a bird's head), foreparts of cheeks and chin; yellow face sharply defined; green generally darker bill horn-colored. The irises are brown and the cere and feet are pink-flesh color. They average 7 inches (18 cm) in length, including the tail. Female lack the yellow on the forehead that can be seen in males. Immatures look like females, except they have a shorter tail.